Learning to drive is quite complex as you can imagine. There is so much to take in when you are on a driving lesson you can return home exhausted and even feel like you have forgotten everything you have been doing. This is where this student zone can help you revise subjects whilst in the comfort of your own home. You may even learn something brand new or pick up a few tips. If your learning to drive with parents this section will be an essential tool in confirming that you are doing what you should be doing. After all the driving test has changed over the years and what was acceptable when your parents took a test may well be out of date today. Have a browse and see what you think. Don't forget to tell your friends about the site. If you can think of any other subjects you would like to see more information about then don't hesitate to let us know. Any feedback will be welcomed! During your driving test you will be asked two 'Show me, Tell me' questions. At the start of the test the examiner will ask you a 'Tell me' question where you will give a verbal explanation, during the drive you will be asked a 'Show me' question where you will have to physically demonstrate an action. Here is a list of the questions. 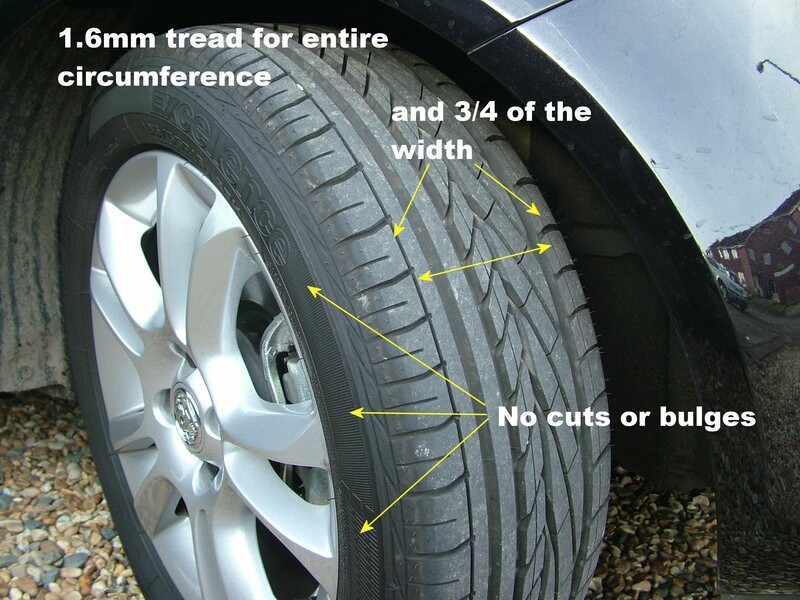 Minimum of at least 1.6mm of tread depth across the central three-quarters of the width, and around the entire outer circumference of the tyre. No deep cuts or bulges to the tyre wall. Warning light should illuminate and stay on if there is a fault with the anti-lock braking system. Explain you’d operate the brake pedal (turn ignition on if necessary), make use of reflections in windows or doors, or ask someone to help. Operate switch (turn on dipped headlights and ignition if necessary). Check warning light is on. Should be used when visibility is seriously reduced, often when visibilty is less than 100 metres.. 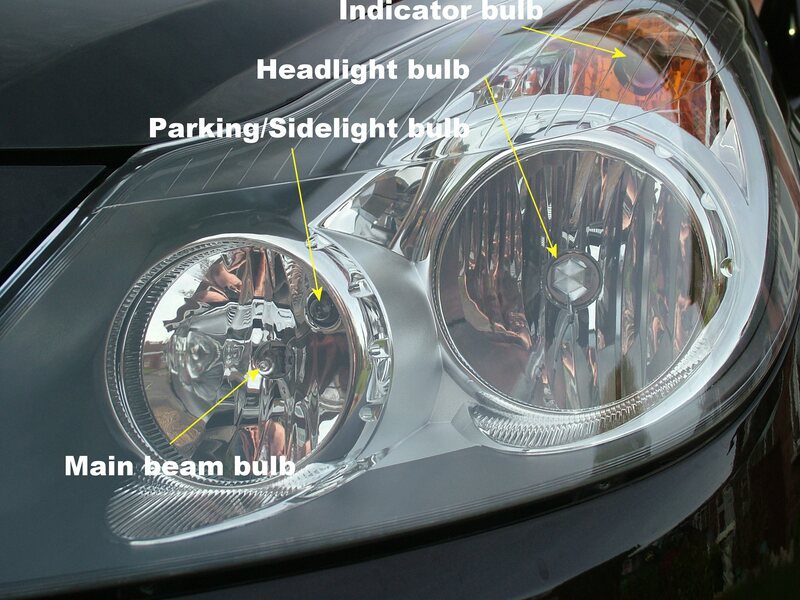 Operate headlight switch (with ignition or engine on if necessary), push indicator stalk towards the dashboard, check with main beam warning light. 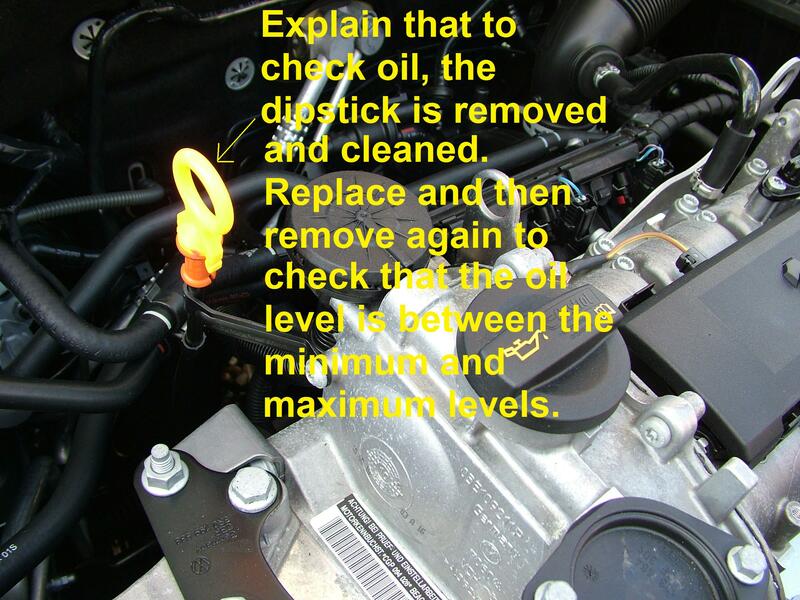 Identify dipstick/oil level indicator, remove and wipe clean, re-insert, remove and inspect. 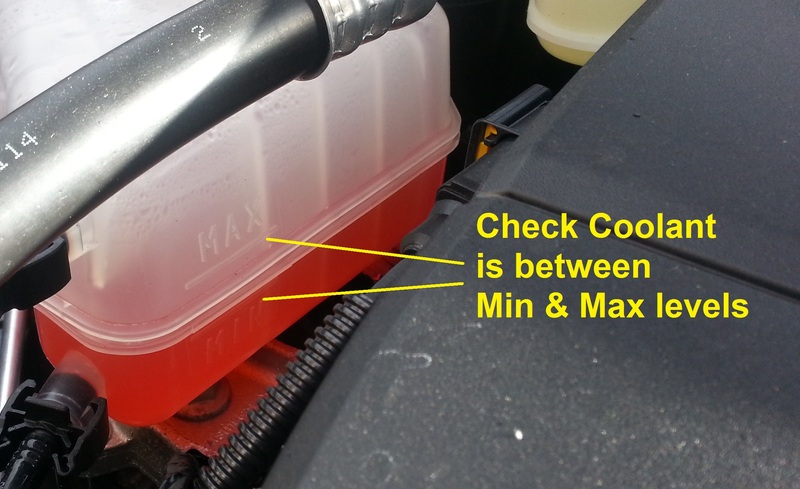 Check oil level against the minimum and maximum markers. 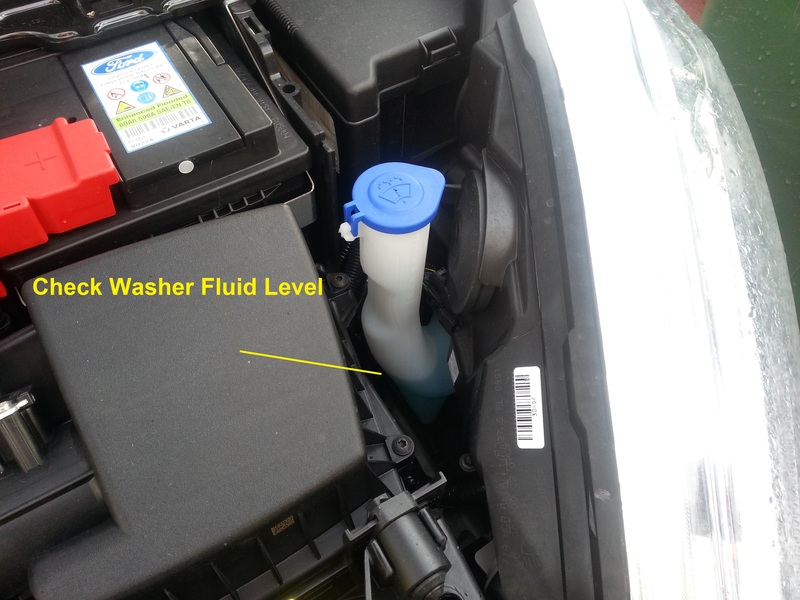 Identify min and max level markings on header tank where fitted or radiator filler cap, and describe how to top up to correct level. Cap should not be removed if tank is hot (pressurisation). Identify reservoir, check level against min and max markings. When you get into a car you need to carry out a series of checks before you can start the engine and drive away, this routine is known as the cockpit drill. Once seated in the driving seat you have responsibility for the car and any passengers you are carrying. DOORS: Firstly check that all doors are securely closed. SEAT: Adjust the seat so that you are seated comfortably and are able to fully depress the clutch pedal with your left foot leaving a slight bend at the knee. To do this you may need to move the seat base forwards or backwards or even adjust the height of it. The seat back can also be moved forwards or backwards by turning the seat ‘rake’, usually located on the lower sides of the seat back. Don’t forget to adjust the head ‘restraint’ so that it’s furthest point forward is in line with the furthest point back of your head. That way should the car be hit from behind it will restrict your head being thrown backwards too much. STEERING: Make sure you can reach all parts of the steering wheel with both hands freely, and whilst holding it in either the ’ten to two’ or ‘quarter to three’ position you should have a slight bend at each elbow. Some steering columns can be raised or lowered by first releasing a catch. Once adjusted ensure it is securely locked back in position. SEATBELT: Put your seatbelt on making sure there are no kinks or twists in it and it lies flat across your chest. This should help prevent the belt injuring you in the event of an accident. 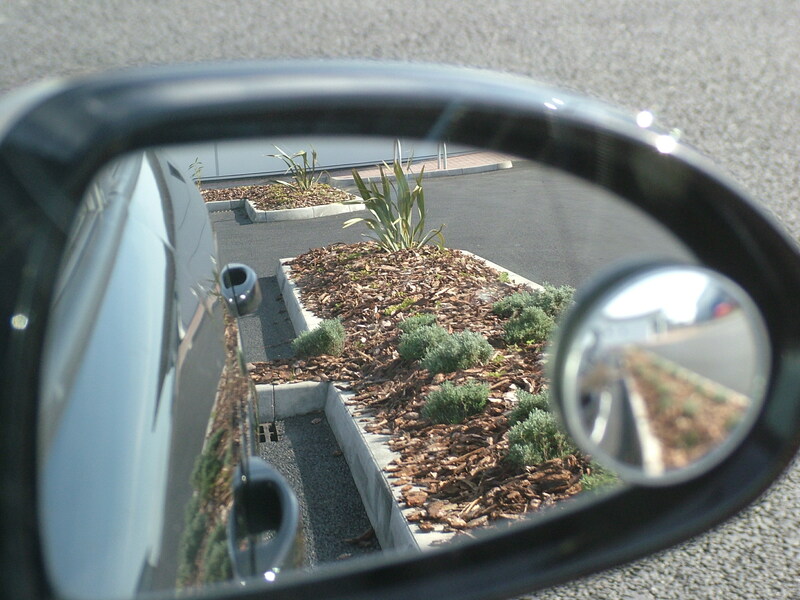 MIRRORS: Adjust your mirrors to cut down ‘blind spots’ surrounding the car. 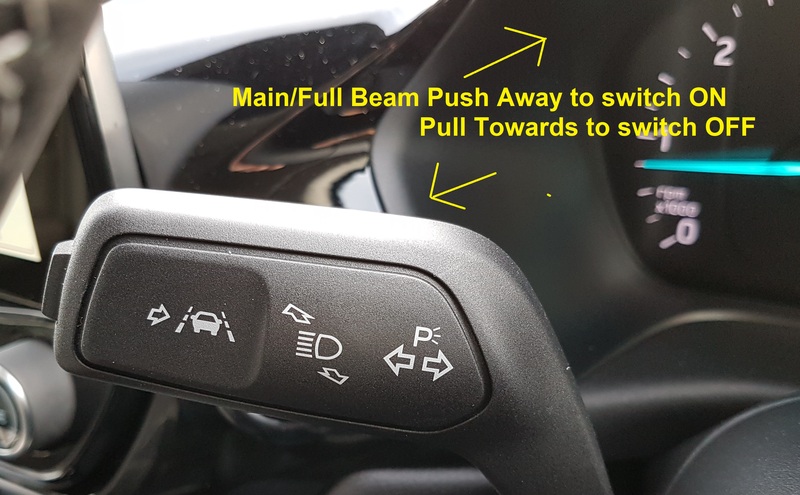 Whilst being seated the way you are intending to drive adjust the rear view mirror with your left hand so that you can see the whole of the back window, with it being slightly offset to the right to see more to your ‘offside’. Be careful not to get fingerprints on the glass as it will obscure your view once it gets dark and following vehicles headlight illuminate the prints! The glass in the rear view mirror is flat and gives a true picture of what is behind you without size or distance being distorted. Adjust the door mirrors with the horizon running horizontally across the centre of the mirror and the sides of your own car should be visible too. This is important so that you know where everything you see is in relation to you. Door mirror glass is often convex to give a wide angled view but in turn distorts the image making everything seem further away than it really is. Therefore never use your door mirrors to accurately judge another vehicles speed or distance. To help you with the cockpit drill, remember D.S.S.S.M. One final thing, before starting the engine, check the handbrake is on firmly and the gear lever is in neutral. (Some drivers leave the car in gear to prevent the car rolling away in the event of a handbrake failure). 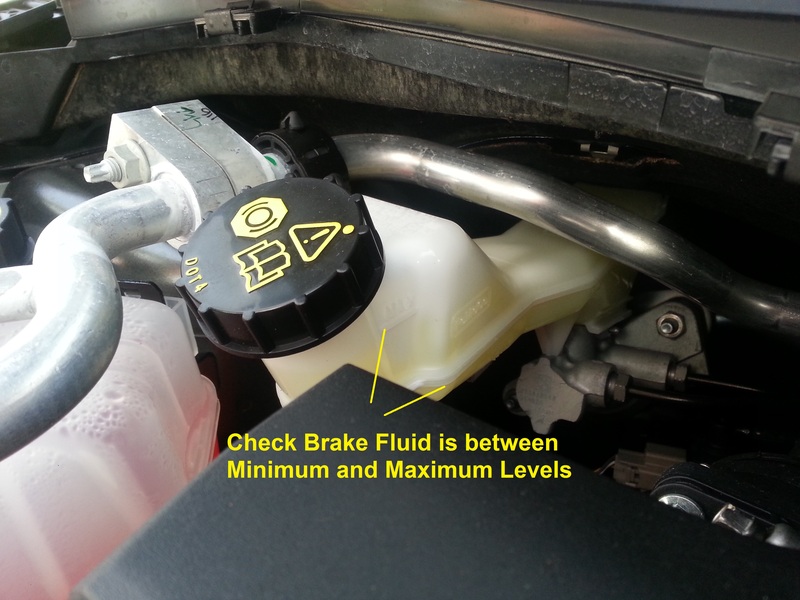 Before you start the engine you need to carry out some precautionary checks. Make sure the handbrake is applied and that the gear lever is in neutral. To start the engine, turn the key until the warning lights are all displayed. If your car is diesel you may need to wait for the orange coloured glow plug warning light to go out before starting the engine. Turn the key one more stage and the engine will start. Once started release the key and ensure the oil and ignition warning lights go out. 1) Clutch pedal down fully. 3) Set the gas and keep it steady. 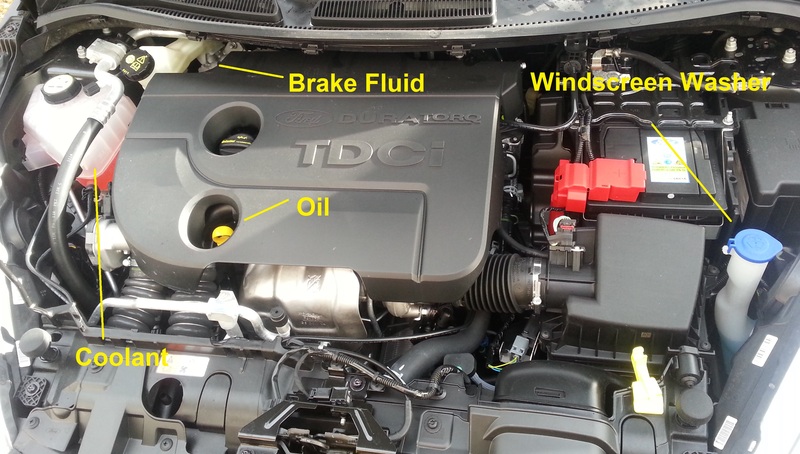 4) Slowly bring the clutch up until your either hear the engine tone change or feel the car ‘jolt’ slightly. Then keep the pedal still. 5) Observations using mirrors and right shoulder blind spot check. 6) Put on a right signal if there is anyone around who will benefit. 8) If necessary check your right blind spot again. 9) Slowly bring the clutch up and the car will begin to move. 10) Apply more gas as necessary. 11) Bring the clutch up fully. As you move away do so at an appropriate speed to join in and keep up with the traffic flow. Ensure as you move away you are not causing anyone to have to alter their course or speed to avoid you. Don’t sit at the side of the road with your right signal flashing. If someone stops to let you out you have in effect caused someone to alter their speed and so you will be faulted accordingly. Only apply your right signal if necessary when you are actually going to move away. premature wear as a result. Before bringing the car to a stop you will need to select somewhere that is a Safe, Convenient and Legal Place (S.C.A.L.P.). To give you an idea of where you can’t stop you should avoid, bus stops, driveways, bends, brows of hills, zig-zag markings, double yellow lines, red routes, school entrances to name but a few. Use your common sense and ensure traffic can safely pass you. Use the MSM mirror signal manoeuvre routine. 2) Signal if necessary (only omit if there isn’t anyone at all anywhere in view). 3) Guide your car towards the side of the road. 4) Cover the footbrake and clutch. 5) Apply the footbrake gently to start slowing the car. 6) Just before the car comes to a stop put the clutch down fully and keep it there. 7) Apply the handbrake (push the button in so it is applied silently and release it to lock handbrake in place). 9) Cancel signal if it was applied. Use progressive braking techniques when stopping the car. To do this you need to brake very lightly to start with, and increase the pressure as necessary. As the car starts to slow right down almost to a stop, you release the pressure, not completely but enough to allow the car to roll on a little to a smooth stop. If you were to keep the fully applied pressure throughout, the car would come to a sudden halt as you slow, which can feel uncomfortable for you and your passengers! When you apply your footbrake, you will illuminate red brake lights at the rear of your car to show following traffic that you are slowing. If you feel that you need to do this in advance of stopping, it only takes the slightest amount of pressure on the pedal for them to come on. rolling along for some distance. This is referred to as coasting, the stability of the car is compromised and the brakes have to work much harder to stop the car. If you are driving along in say 4th gear and you are bringing the car to a stop at the side of the road, there is no need to change down through the gears. In the good old days drivers were taught to do this for engine braking to help slow the car down. Now cars are much lighter and have more efficient brakes, it is acceptable and in fact preferred for you to leave the car in whatever gear you are in and just stop. Once you have stopped you can then select neutral. When a approaching a junction there is a routine you can follow to ensure you negotiate it safely. This is called MSPSL. Mirror, Signal, Position, Speed and Look. The following guide is using MSPSL, there is another system which can also be used known as IPSGA. Information, Position, Speed, Gear and Accelerate. The steps below refer to 30mph roads. 1) MIRROR: On approach about 10 car lengths away check your rear view mirror and left door mirror to check following traffic. 2) SIGNAL: As soon as you have checked your mirrors apply your left signal. Ensure there are no other junctions or major openings on the left before the junction as your signal may give the impression you are turning into one of them. If so, delay the signal until you have passed them. 3) POSITION: Keep to the left and follow the curvature of the kerb so when you come to a stop you are at an angle ready to drive away. 4) SPEED: Brake progressively on approach to the junction so your speed reduces gradually to avoid harsh braking when nearing the line. Change gear if necessary. You should approach all junctions with the intention of stopping and only go when you can see it is actually clear. 5) LOOK: You will need to look both left and right. Look to the left to see if there are any parked vehicles that will force you to turn onto the other side of the road. If so you will need to give way to traffic from the left. There may be parked cars on the opposite side of the road forcing traffic from the left to approach you on the wrong side. Again you will need to give way as to avoid a head on collision. When looking right you will obviously give way to traffic, but if someone approaches with a left signal to turn into your road and they are close enough to hit you should their signal be wrong then wait. Once you see a second sign such as the car slowing heavily or the car actually starting to turn then you will know for sure that it is then safe. If the vehicle is large such as a bus or lorry, be aware of vehicles behind it that are obscured from your view. They may try and overtake the turning vehicle, and you would be in danger if you are in the process of emerging. If you can’t see then don’t go. Think LADA. DECIDE what course of action to take. 1) MIRROR: On approach about 10 car lengths away check your rear view mirror and right door mirror to check following traffic. 2) SIGNAL: As soon as you have checked your mirrors apply your right signal again checking for junctions or openings before the end of the road. Delay signal if necessary. 3) POSITION: Keep near the centre line of the road you are on, and when you come to a stop keep the car pointing straight forward with your wheels straight. 4) SPEED: Again brake progressively and approach with the intention of stopping and only emerge when safe. 5) LOOK: Look left and right with the same considerations as above. 1) MIRROR: About 10 car lengths away check mirrors. 2) SIGNAL: Signal, again delay as necessary if there are any other openings. 3) POSITION: Keep to your normal driving position about a metre from the kerb. 4) SPEED: Brake progressively and reduce your speed, changing gear as necessary. If you are driving fast you would normally change down to second gear in order to turn. If a gear change is required you must ensure that as soon as the change is made you bring the clutch back up. If the clutch is left depressed the car will be rolling (coasting) and if left in this state you may find the car uncontrollable as you try and turn. Ideally your speed will be about 10mph as you make the turn. 5) LOOK: Look into the new road to see if it is safe to turn into, if the road is narrow with parked cars you may have to wait for another car to emerge before you yourself can turn into it. If pedestrians are already in the process of crossing the road you will have to give way to them. 2) SIGNAL: Signal, delaying if necessary. 3) POSITION: Position near to the centre of the road. You will need to give way to oncoming traffic. If you do have to come to a stop, try not to let the front of the car go beyond the centre of the road you are turning into as you may make it very difficult to negotiate. Also ensure you keep your car straight with the wheels kept straight, that way should you be hit from behind your car will be pushed forward. Sitting with your car at an angle or with the wheels turned can be dangerous. If you were hit, you would be pushed across the road head on into whatever vehicle is approaching you! If you are waiting to turn and not sure if you have time, ask yourself if you would have time to walk across the road, if so you would have time to drive it. Assuming that there are no approaching vehicles to wait for and you are free to turn, you must not turn too early and ‘cut the corner’, crossing over the centre line of the road you are turning into. To avoid this wait until the front of your car is nearly level with middle of the new road and turn. The main thing is, look into the road you are turning into and look where you want the car to go, and you will put the car in that place. 4) SPEED: If free to turn, again use second gear and do so about 10mph or as necessary. 5) LOOK: As above assess the new road. if the roads are faster than 30mph you would need to start the process earlier, as it more about how much time you give to show your intentions as opposed to how far from a junction you are. As stated above, approach a give way line with the intention of stopping and only go when you can see it is safe. That way if you can’t see then you are not going to pull out and endanger anyone. Your approach to the junction would also be very smooth and planned. Once you start thinking the opposite and approaching junctions with the intention of just going and only stopping if you see traffic will cause problems. Firstly your observations will be poor and should you see traffic you will most likely then brake very heavily, affecting your positioning and possibly resulting in your car being rear ended. Junctions with limited visibility are referred to as ‘closed’ junctions. Those that have a clear view in both directions well before you reach a give way line are called ‘open’ junctions. Open junctions are usually the ones you can emerge from without stopping if clear because you can make that decision on your approach. Some junctions have such limited visibility they will be marked with a STOP line and STOP sign. You are required by law to completely stop before emerging. On a test it is a good idea to apply the handbrake to prove you have actually stopped, it removes any doubt as to whether you stopped completely or not. Not so common now are unmarked junctions. An unmarked junction is one without any road markings. Never assume you have priority, it’s best practice to assume you are the one giving way before proceeding. It’s not essential for you to apply the handbrake every time you stop at a junction. When you first learn to drive you most likely will do it every time for practice and better control. Once you are proficient with the controls of the car then you can decide whether the junction necessitates the use of the handbrake. Apply the handbrake if there is the possibility of the car rolling backwards or you are waiting for more than 3-4 seconds for traffic, or for the sake of pedestrians or other vehicles around you to make the situation safer. When turning left, remember that the rear wheels take a shorter route than the front, so if you are too close to the kerb the rear wheel may mount or strike it. When emerging from a junction you are not to cause another road user to have to change course or adjust their speed to avoid you. Once you have emerged check your rear view mirror to see what is behind you. A fast approaching car will mean more urgency with your acceleration to get up to speed. Failing a test for lack of observation at a junction is in the top ten of faults on a national scale. Probably because test candidates feel they need to be quick at a junction like most other drivers. There are so many accidents around junctions because most people don’t take enough care at them!! Play it safe and check properly before emerging. Roundabouts are designed to keep traffic flowing, usually giving each road leading up to it an equal priority. On approach to a roundabout use your MSPSL routine. It is important that you keep correct position as you negotiate a roundabout and signal your intention clearly so other road users understand where you want to go. This will ensure the roundabout flows smoothly and efficiently. On approach check signage and road markings, which may dictate that you use a certain lane for a particular exit. Remember you must give way to traffic from your right. Here is a general guide. MSPSL, using the left lane with a left signal. Once you have given priority to cars on your right and you drive on, check the road you are turning into is clear and proceed. Leave your signal on until you have exited. MSPSL, with no signal. Position yourself in the most suitable lane, again check for road markings. As you negotiate the roundabout maintain your position in the same lane you approached in until you need to alter course to exit. As you pass the exit directly before the exit you wish to take, signal left. If you were guided to use the middle or right hand lane, remember to check your left mirror for traffic, which may be on your left side. MSPSL with a right signal, selecting the right hand lane or as guided by road markings. Maintain your course in the same lane you approached in until you need to alter your course to exit. As you pass the exit directly before yours signal left. Remember to check for vehicles, which may be on your left side. 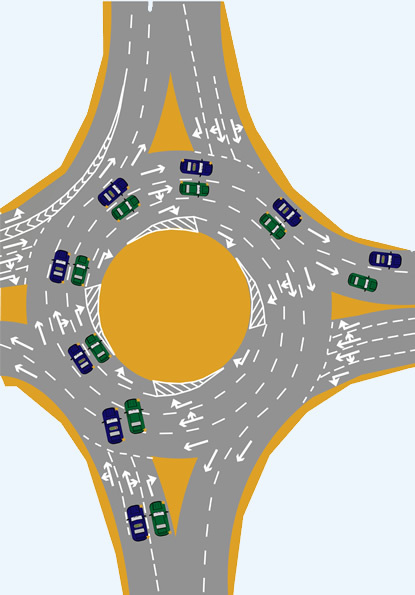 Usually you will need to change down to 2 or 3 gear to negotiate a roundabout if there is no requirement to stop. Try and time your arrival at the roundabout to coincide with a gap. The busier the roundabout looks, the slower you need to approach to again arrive at a suitable gap. If this is not possible, then approach to stop. If you are behind a car make sure when they move forward you see them drive away before deciding to go yourself. A common incident at roundabouts is when a driver thinks the car in front has gone, when in fact it has only moved forward, and the driver behind then tries to go only to hit the stationary vehicle in front of them! It really is important that you approach a roundabout at a speed suitable to be able to read what is going on and make a decision as to whether it is safe to go or not. Usually the slower you approach, the more likely you are to be able to go. Driving on to a roundabout too fast cutting in front of cars is dangerous, but so is stopping at a roundabout if there is no traffic and is clear to proceed. If the driver behind can see it is clear, they will not be expecting a car in front to stop. You can imagine what would then be likely to happen. Mini roundabouts are usually painted on the road surface or are slightly raised. This is usually to allow large or long vehicles to pass over it, if they are having difficulty negotiating it. The same rules apply to mini roundabouts as they would any other. The limited space means that you may not always have time to signal your intention to exit. Ideally there shouldn’t be more than one vehicle at a time on a mini roundabout. If it is a double mini roundabout, treat each mini roundabout as a separate one. Try not to enter the first roundabout if your entrance to the second one is blocked by a waiting vehicle. Be cautious at mini roundabouts, even some experienced drivers can get confused and see a mini roundabout as a junction instead!! This often results in them driving across your path or sitting and waiting when they have priority to go!! 3) Set the gas, the steeper the hill the more gas you need. 4) Find the biting point, then keep your foot still. (tip look for the bonnet to rise slightly, if the bonnet rises the car is trying to move forward. As long as you keep it like that you shouldn’t roll backwards once you release the handbrake). 5) All round observations including mirrors. 7) Start to release the handbrake. 8) Final blind spot check/observations. 9) As you fully disengage the handbrake, return your hand to the steering wheel and bring the clutch up slowly and the car will move forward. 10) Listen to the engine as you are bringing the clutch up, if it is dying apply more gas to compensate. Downhill - Moving downhill is much easier as the car wanting to roll forward will aid you moving away. The use of the footbrake is to enable you to control the rate at which the car moves away. 2) Select 1st gear or even 2nd on some slopes. 3) Depress the footbrake fully. 7) Final blind spot check/observations. 8) Release the footbrake (slowly if you want to move away slowly!). 9) Clutch up as the car moves away (Don’t take too long as the car may start to roll faster and faster (coasting)). Because it is possible for handbrakes to fail there are ways in which you can prevent your car from rolling away whilst you leave it parked. Pointing uphill with a kerb on your left - Leave wheels turned to the right pointing into the road, if the car was to roll the front left tyre will be stopped by the kerb and the car will stay in still. Leaving the car in 1st gear will also prevent the car from rolling backwards. Ensure you put it into neutral before starting the engine! Pointing downhill with a kerb on your left - Leave wheels turned left pointing towards the kerb, if the car was to roll the front left tyre will be stopped by the kerb, and the car will stay still. Leaving the car in reverse gear will prevent it from rolling forward. Once again you must ensure you put the gear into neutral before starting the engine! Caution - Bearing in mind what has been said above, gears and wheels being chocked are no substitute for your handbrake, which should be fully engaged and in good working order. Many drivers leave cars in gear, which is why you should always check it is in neutral as part of your precautionary checks before starting the engine. It’s also best to check the handbrake first, if the gear really is holding the car still without the handbrake being fully applied the car will roll as you pull it out of gear and into neutral! When you are moving away from the side of the road on a hill, bear in mind that large vehicles climbing a hill may have difficulty moving away again if you cause them to slow or stop. If vehicles are descending a hill it will be much harder for them to stop or slow to avoid you if you do not move away quick enough. MSPSL stands for Mirrors, Signal, Position, Speed and Look. As a driver you will be doing this all the time whether you are approaching a junction, roundabout a parked car or even the location of a school. You must have heard of MSM, Mirror, Signal, Manoeuvre? Well it’s a bit like that only we are preparing for an actual or potential change in speed or positioning of our car. Firstly let’s look at hazards. 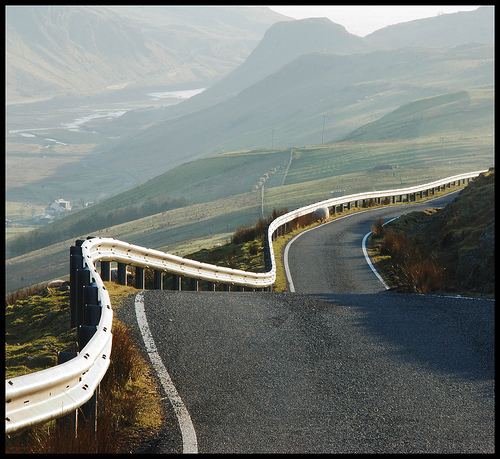 Some hazards are actual features of a road like a bend, a brow of a hill, a junction and roundabouts etc. Some features are not always there like parked cars or road works. You might have bad weather affecting the surface of a road like heavy rain, ice, snow or even fallen trees in strong wind. Some hazards are even moving like a cyclist or a pedestrian crossing the road. The list could be huge but there is a routine you can follow when you identify a hazard to ensure it is negotiated safely. Mirrors: Firstly check your mirrors, think about what you see and act on it. Do you know what the following vehicles intentions are? Is the following vehicle considering your own intentions? Signal: Decide on whether giving a signal will benefit another road user in understanding what you are intending to do. If so, give the signal in good time. In some circumstances signal timing is crucial if you want to avoid it being misleading. Position: Having assessed your surroundings decide on the best way to negotiate the hazard. Sometimes you may have to position yourself as to make your intentions obvious or even comply with road markings or signs. Speed: Adjust your speed appropriately by either accelerating, decelerating or braking smoothly. Gear: If necessary change to a suitable gear for greater control. Look, Assess the situation, Decide what needs to be done, Act upon your decision to wait or continue. Drive as you normally do, don’t drive along really slow in anticipation. Obviously there shouldn’t be any cars following you and the examiner may or may not look over their shoulder out the back to double check. When the command is given don’t check the mirrors as there is no time, keep both hands on the steering wheel and brake firmly. As the weight of the car is thrown forward the steering will become heavy and harder to control. Just before the car completely stops put the clutch down to prevent the car stalling. You don’t want to put the clutch down too early, as it is good for the ‘engine braking’ to assist the footbrake (I will explain engine braking shortly). When the car has stopped completely put the handbrake on, select neutral and wait. The examiner will then ask you to drive on when you are ready. Prepare the car to go, check over your left shoulder (you may be far away from the kerb allowing room for bikes to pass on the left), check mirrors and then over your right shoulder. If it is safe, drive away. If a car is approaching you when you check around and it looks like they will overtake you, stay put, check again and drive on when safe. Once you are moving the examiner may say something like “Thank you, I will not ask you to do that again”. Job Done! Skidding: When stopping the car in an emergency you need to brake firmly and progressively to slow the wheels as quickly as possible, almost to the point where the wheels may lock but not enough for it to actually happen. If you do lock the wheels and you skid it will take longer to stop. If you are skidding it may be necessary to release the footbrake for a split second and re-apply them. Hopefully the second time round you won’t skid! If the road is wet or you are on gravel the wheels may lock up sooner as the tyre loses grip, so the braking pressure may not be as hard as on a good firm dry surface. If you are driving on mud, snow or ice where it is virtually impossible to brake firmly, you may have to pump the brakes, quickly braking-releasing-braking-releasing and braking again, each time the car slows a little. This is known as cadence braking and is an extreme form of braking. Some cars are equipped with ABS, which is an Anti-locking Braking System. Basically if you brake extremely hard a sensor triggers the system into applying and releasing the brakes very, very fast. The point of which, means, that the wheels should not ‘lock-up’ as described above, and should allow you to steer whilst braking. The ABS being triggered has a distinctive noise, if you hear it don’t release the pressure on the brake as the system is just doing it’s job. It doesn’t mean you can stop any quicker than a car without ABS but will enable you to steer whilst braking heavily. It is possible for a car even with ABS to lose grip if the surface driven on is very slippery or loose. You should be guided by your vehicle’s handbook, or manual as to what kind of braking system you have and what type of braking style should be applied. If the rear wheels of a car lose grip the car may actually start to slide sideways as the rear of the car tries to ‘overtake’ the front which is braking with better effect. Try and steer into the skid, so if the rear is going to your right, steer right a little. Try not to steer too much as you are likely to over correct and spin the other way! Engine braking: You have your handbrake, which basically pulls the back brakes on to stop the car rolling away when your stationary. You have your footbrake as described above. There is another kind of braking called ‘engine braking’. Have you noticed that when you take your foot off the gas pedal, the car starts to slow? Well when you do this, the fuel supply is reduced to the engine so it slows down, and slows the car along with it. This is why if your on a downhill slope and you engage a ‘low gear’, the engine helps hold the car back from rolling faster and faster. If you put the clutch down which disconnects the engine from the ‘drivetrain’, the engine braking is lost, and the car will freewheel and roll faster (don’t do it!). This known as coasting, your brakes need to work harder to stop the car too. When we slow or stop a car whether it being gradual or in an emergency, the engine braking contributes a great deal in stabilising the car and helping it to slow in a controlled way. The Driver: When cars lose control it’s generally down to driver error. Learn how to recognise factors, which will affect either you or the handling of the car. Driving whilst tired or under the influence of drink or drugs is quite simply going to affect your reactions or ability to assess what the road ahead and is basically illegal. Some medicines carry warnings too that you must not drive if you taking that particular medication. If your reactions are not up to their usual speed, for example maybe you have a cold, recognise it and adjust your speed to give you more time to react. That way you can avoid having to stop in an emergency in the first place. With regards to car handling, think about the road and weather conditions. Look at the roads surface and think about how your grip could be compromised. Think about how rain and ice affect the distances needed to stop. Look at the slope or camber of a road, will the car try and slide in a particular direction if you were to brake hard? Is there a lot of activity by pedestrians either side of the road, or cars trying to pull out of blind junctions? Sometimes other people will force you into taking some action to avoid an accident. If your looking for the clues of what is likely to happen next, and drive at a speed so that you can stop in the distance clear ahead, identify whether the road surface is going to affect your braking ability, you can avoid most ‘emergency stop’ situations in the first place by being ready. If you find it hard to do, then keep your speed down. If your having trouble remembering stopping distances as quoted in the highway code there is a simple formula to work them out. Firstly there is the ‘thinking distance’, which is the distance that your vehicle will travel in the time it will take you to see a hazard and then actually start to brake. Our reaction times are usually between 0.5 to 1 second but other factors can make them longer! The Highway Code quotes the thinking time at approx 0.7 seconds, the convenience of which means you will travel about the same number of ft (feet) as miles per hour that you are driving. So, if your travelling at 40mph you will travel about 40ft from seeing the hazard to actually engaging the brake. By adding your Thinking Distance and Braking Distance together you will find the ‘Total Stopping Distance’. Don’t forget wet surfaces can double your stopping distance and ice and snow can increase it by up to 10 times. Distances below are in feet. To convert to metres 10ft=3metres. Note that when you double the speed, the stopping distance trebles! If every single driver was to keep a more than adequate distance from the vehicle in front of them at all times, the amount of traffic accidents could be reduced dramatically. As you have probably noticed, drivers fail to keep a safe distance and as a result, a rear end collision is a common sight. There are ways to protect your self from causing a rear end collision, or being involved in one. If you keep at least a two second gap between you and the vehicle in front, you can reduce the chances of a collision should the vehicle in front of you brake sharply. You might ask why would the vehicle in front brake sharply if the road before them appears to be clear? Who knows, anything can happen and you have no idea how the driver in front might react. They may overreact to a situation before them, or misread a situation and brake harshly. Keep at least two seconds back and reduce the chances of being involved. How to apply the two second rule. When you are following a vehicle, look for something that is stationary at the roadside or on the road itself that you can use as a marker. A signpost or road marking is ideal. As the vehicle before you passes the marker say, “Only a fool breaks the two second rule”. As it takes about two seconds to say this, if you pass the marker before you have finished this sentence, you are too close. Fall back and try again. You should be able to say the sentence before passing the marker. If the road surface is wet, you will need to double the gap and say it twice, leaving a four second gap. If your driving a fully laden vehicle, or a large vehicle or perhaps towing a trailer or caravan, you would need to compensate even more as it will be harder for you to stop. Have you also considered that by leaving a suitable gap between you and the vehicle in front, it will help drivers behind you should they wish to overtake? The gap before you would allow a following vehicle a space to overtake you and take refuge, before overtaking the next vehicle. When drivers fail to leave gaps, it forces drivers who wish to overtake to try and pass many vehicles at a time creating a dangerous situation. There will be occasions where no matter how fast you are going the driver behind will still want to go faster. If you too are following a vehicle, it can be frustrating as to why a driver behind you, can’t see for themselves that your own progress is hindered, and keep their distance. If you are keeping your two second rule, you should be able to stop, but the vehicle following you will most likely be unable too resulting in your car being rear ended. For a start try not to get worked up and brake in aggression, other than being dangerous it will aggravate the following driver who incidentally may not even be aware of the danger they are causing, whether it be due to ignorance or just lack of awareness. Just try to increase the gap in front of you to compensate for the driver behind you. Should the vehicle in front brake harshly, you won’t have to brake as hard, and therefore it should also allow the following driver to slow without losing control. It may even persuade the following driver to overtake you thus eradicating the problem completely! If a driver in front of you is tailgating someone else, still leave a bigger gap in front as the chances of an accident ahead are increased and will allow you more time to take action. Tyres on tarmac, escape route. When you stop behind a vehicle, leave enough room to be able to pull out and go around the vehicle in front should it fail to move away due to breaking down. It can happen, and if everyone is nose to tail there is gridlock, and will necessitate the driver at the back of the queue to reverse followed by everyone else, you can imagine the mayhem! When you leave an adequate gap you should be able to see the rear tyres of the vehicle in front in contact with the tarmac. There are other reasons for this gap. If an emergency vehicle approaches from behind, it will leave enough room for you to move forward and to the side without having to wait for the vehicle in front to move forward too. If you are unfortunate to be hit from behind, it will reduce the chances of you hitting the car in front of you. Less people involved and less damage to your car. With the right planning you may be able to move out of the way of a following vehicle failing to stop in time. Leave a safe gap, monitor the following traffic, plan your escape route and prepare to use it! Expect the unexpected! For the purposes of a driving test you will reverse behind a single parked car and you will be given two car lengths to complete the manoeuvre in. You won’t usually be asked to park between two parked cars. If in reality you were to park between cars you would need at least one and a half car lengths to do it in safely. Parallel parking is classed as the same manoeuvre as reversing into a car parking space, so it is unlikely you will have these two manoeuvres together in any given driving test. 1) Once asked to perform the manoeuvre approach he parked car just as you would if you were intending to drive past it. Check your mirrors to see if anyone is following. If there is a car following some distance behind you or driving towards you, you might be best to apply a left signal to show your intentions. Try and draw up alongside the parked car about an arms length away. 2) Once in this position select reverse gear as soon as possible to illuminate your rear white reversing lights and then apply the handbrake. Anyone approaching you from behind should then realise that you need some space and leave a suitable gap for you. 3) All round observations. Make sure there are no approaching vehicles. Look over your left shoulder and reverse slowly. Just as the rear of your car starts to pass the back of the parked car, steer left. Remember as you steer left your front offside will swing out into the road so check your offside blind spot as you steer. Give way to any cars that are intending to drive past. Steer a lot but not full lock, as you will swing out wide. 4) The best angle to approach the kerb is about 45*, it sounds technical but just look out of the back window and watch the kerb go across it. When the kerb disappears out of the offside rear corner you will be at about the correct angle of approach so now straighten your wheels. The car will now be heading for the kerb and may start to roll fast if there is a steep camber on the road. 5) Now the hard part, if we steer right too early you will be too far from the kerb. Too late and you might end up on it!! Reverse back and try and judge when your passenger is in line with the driver’s side of the parked car, just as you would if you were looking down the side of a car trying to look for small dent’s in the doors. When you feel that your passenger is in that position you are about the right distance from the kerb to steer right full lock. The front of the car will swing in towards the kerb. 6) Whilst looking out of the rear window where you are going, keep a check on your left door mirror to see if your back wheel is going to hit the kerb. When you are becoming parallel with the kerb straighten your wheels. Remember that when you have the steering on full lock, the wheels stick out quite a lot and will strike the kerb if not ‘tucked in’ in time by straightening them. Once straight secure the car with you handbrake and select neutral. Keep your speed to a minimum. When performing this manoeuvre for the first few times students tend to go too fast and end up hitting the kerb. You really need accurate clutch control for the first stage and feathered braking with the clutch down for the second stage where the car tends to roll by itself. If your rear nearside wheel is going to hit the kerb then stop the car. You are allowed to move the car forward and reverse again, you will not fail for doing this. To make a correction, apply the handbrake so you don’t roll back, select first gear and find the bite. Check all round and move forward a few feet now steering left and then stop. Select reverse gear, check around and reverse back again (most likely letting the car roll slowly if on a sloping camber). Steer to the right again as fast as you can, full lock. This is giving you a second chance again to park the right distance from the kerb. If instead when you originally park you are going to be too far from the kerb, you need to spot it early and straighten your wheels to put the car closer to it, before steering right full lock again to put yourself parallel to it. If there are any pedestrians on the pavement walking by, stop and wait until they are clear of the space behind you. Never reverse towards people. I can’t stress enough how important it is to keep a look out for approaching cars and pedestrians and to look in the direction you are travelling. If you are having problems with remembering which way to steer, remember ‘Lovely Red Roses’ for Left, Right, Right. 1) Position yourself so that you are 90 degrees to the parking bays. Let’s assume you are reversing to the left. 4) Reverse back slowly, when you can see a white line roughly lined up with the centre of the passenger door steer left full lock. (You are likely to end up in the 3rd bay from the line. 5) As the car swings round check to your right to ensure no cars are trying to drive past, also keep a look out for pedestrians. 6) Check where the car is heading. 7) After a short while you will see the left side white line appear in the left door mirror followed by the right hand line in your right door mirror. 8) Adjust your steering accordingly to put the car equally between the lines. 9) When the lines appear parallel straighten. 10) Check all around for pedestrians as you reverse the car in to the space fully. 11) If you are incorrectly alligned, check it's safe before moving forward and adjusting your position before reversing back again. 12) When you are safely parked, secure the car. 1) Select a space you wish to reverse into, let’s assume it’s again on the left. 2) As you approach it and the front of the car draws level with the far side of it, steer to the right to turn away. 3) You should then be able to look out of the rear window and see the space directly behind the car. 4) Secure the car and select reverse. 6) Reverse back slowly steering as necessary to put the car equally between the lines. 7) Check your door mirrors for accuracy but keep a constant all round look out for cars and pedestrians. 8) When the car is fully in the space, secure the car. Door mirrors are convex to give a wild angled view. This can ‘bend’ images and give misleading information on your true position. Check both door mirrors not just one, and get a balance of the two images you see. All round observations throughout are paramount. In terms of a driving test it won’t matter too much if the car is at an angle within the lines. You must be between the lines with none of your wheels touching them. If you can see the car is going to end up on a line, move forward a good distance and reverse back again. You won’t fail for doing this. Remember that even a small amount of steering when reversing will cause the front of the car to swing out possibly over a line. 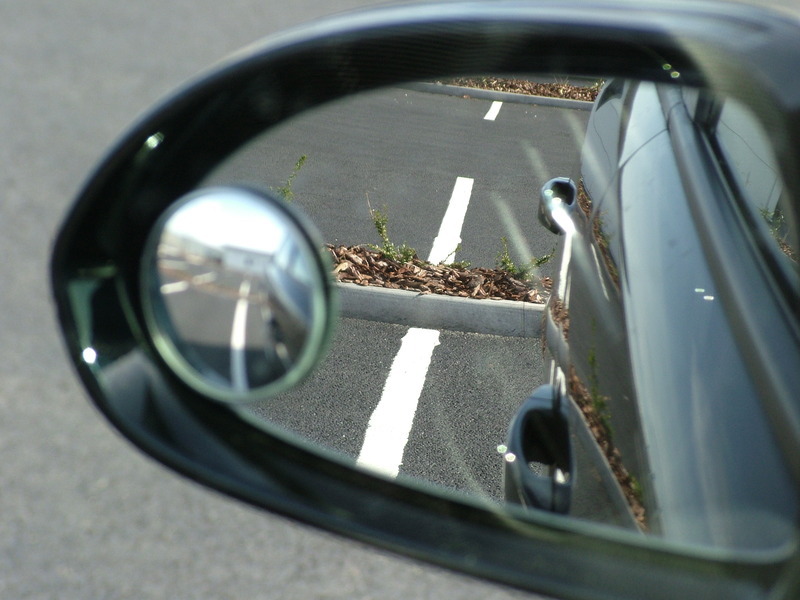 Although the door mirrors are ideal for checking your position, remember that is all you want to do with them, is ‘check’. You should be keeping a look out all around you and actually look at where you are going. Don’t rely solely on the mirrors. Turn in the Road (No longer equired on test, but should you end up in a situation that requires you to turn around you would be expected to be able to do this). Firstly make sure you are on a road wide enough to perform the manoeuvre within your ability. Is the location safe and lawful? Ensure there are no obstructions at the kerbsides such as trees or lampposts that you may collide with. You need a clear unobstructed view of the road in both directions. This will also ensure that you too will be seen by approaching traffic. Remember that it up to you to give way to any traffic that approaches, they may want to drive past without stopping. Also give way to pedestrians that are using the pavement in front of you or behind you, never drive towards people. The secret to this manoeuvre is SLOW speed and FAST steering. Prepare the car in first gear. If safe, use clutch control to move forward slowly. Steer quickly to the right to achieve full lock. As you go over the ‘crown’ of the road you may feel the car start to roll down the camber, if so, clutch down and gently use the footbrake to control the speed. As you near the opposite kerb steer left to straighten the wheels. This reduces the amount of work you need to do on the reverse and also reduces the possibility of damage to power steering motors. Stop the car before you hit or overhang the kerb. If necessary, apply the handbrake. Prepare the car in reverse gear. If safe, look over your left shoulder out the rear window. Reverse back slowly steering left. Again as you pass over the crown of the road you may feel the car roll down the camber, if so, clutch down and use the footbrake as necessary. Once over the ‘crown’ look right and steer right. If you find yourself getting close to the kerb as you drive away don’t risk striking it, repeat steps 2 & 3 again. Never beckon other drivers to pass, let them decide for themselves on which course of action to take, but remember, you are giving way to them. Keep a good look out for other road users at all times! There are four types of pedestrian crossing, a zebra, pelican, puffin and a toucan. Approaching any type of crossing can be hazardous as the need to stop can be at short notice and drivers behind may be too close or not as quick at reacting as you. On approaching any type of crossing it is important to observe the situation behind you by checking your mirrors in preparation of being required to stop at such short notice. Think about what you see and act accordingly. Will the following driver stop in time if you do? Would it help to reduce your speed a little? Is anyone waiting to use the crossing? Is the grip your tyres have on the road surface compromised by rainwater? There are many factors that can affect your approach to a crossing and the whole situation needs to be assessed. Crossings usually have zig-zag lines on the road surface leading up to and away from the crossing. This is called the controlled area. You are not allowed to overtake or park within the controlled area. Doing so is a serious traffic offence and you can be fined as well as having points endorsed on your licence if you are caught. Parking on zig-zag markings can obscure a drivers view on approach to the crossing which endangers people who may be already on a crossing or about to cross. Always keep crossings clear, even if you are in very slow moving traffic, if the traffic stops, don’t stop on the crossing itself, keep it clear. When you stop at a crossing apply your handbrake to secure the car. Try not to rev your engine, as pedestrians may feel intimidated. Don’t wave pedestrians to cross as you may endanger them if another car is approaching. Wait until the crossing is clear before you continue. Pelican crossings are controlled by pedestrians who having once pushed a button, will activate a set sequence of lights which will stop the approaching traffic. The sequence would be green, steady amber, red, flashing amber, green. The amber light can be confusing if the crossing comes into your view half way through a sequence, is it changing to red, or going to green??? A simple way of remembering the meaning of the amber is the steady amber light is like a firm hand being held up to say stop. A flashing amber light is like a hand beckoning you to proceed!! Puffin crossings will look identical to a pelican crossing apart from sensors sitting on top of the light column. The sensors can keep track of pedestrians and traffic approaching. Once a pedestrian pushes the button the lights would turn to red as they do a pelican crossing. The lights will continue to stay on red halting the traffic, until the crossing has been cleared of pedestrians. Rather than a flashing amber light being given for you as a driver to make a decision to proceed, the crossing will show a red and amber light together for you to prepare, and you would then drive on when the green light shows. The sequence would be green, steady amber, red, red and amber, green. The idea of such crossings are to prevent traffic being held up on a red light once the crossing is clear, and also to help protect pedestrians who may find it difficult to cross without the danger of drivers moving on whilst they are still crossing. Toucan crossings again will be similar to a pelican and puffin crossing. The difference is that there will be also a cycle lane that can cross from one side of the road to the other allowing cyclists to use the crossing too. There is often a post with a button for the cyclists to use. You can remember this crossing by saying “two-can cross at the same time” (toucan). As with the puffin crossing there is no flashing amber phase. Zebra crossings can be identified by the black and white stripes you can see on the road. There will also be orange flashing beacons on black and white striped posts. The beacons will flash all the time and a pedestrian will merely approach the crossing to use it. Take care when approaching a zebra crossing, as there are no extra warnings to tell you to stop. You will need to identify whether pedestrians are passing by or wishing to cross. If it is obvious the crossing is going to be used slow down and stop. Do not continue until the crossing is completely clear. School crossing patrols will hold up a circular sign saying stop for children sign. You must obey the sign and only drive on when instructed by the patrol. There are sometimes flashing amber lights on approach to such crossings attached to a warning sign. When following direction signs you will often see 'route numbers' next to place names or exits. Some complex roundabouts use the route numbers on the sign to help you select the correct lane for the desired exit. These are often referred to as a designated lane. The idea is to look at the number on the sign, and then look for road markings with the same number. Disregard numbers on the signs that are in brackets. Such routes may be miles away from your current location, but using the route not in brackets will send you in the correct direction to reach that particular route. Lets look at an example. When you look at the sign, you are entering the junction from the spur at the bottom. If you were heading for FILTON, you would need to turn left first exit onto the A4174. You will see A38 next to Filton, but as it is in brackets you will require that route number at a later stage on your journey. In order to reach that point you are required to follow the A4174. 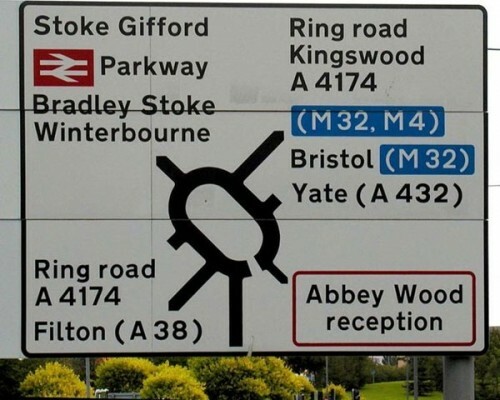 If you were heading for YATE, you will ultimately need to follow the A432, but in order to get there you are following the A4174 as that is the route required in order to get there. So that explains the route numbers, now we need to look at how to select the correct lanes. When approaching the roundabout you will either need to follow a designated marked lane that will take you to a specific exit, or you will negotiate the roundabout as you would any other counting off exits and looking for the one you need. It's not always obvious what information is needed so the more you take in the better prepared you will be. 1)Where is the exit? Left, Ahead, or Right? 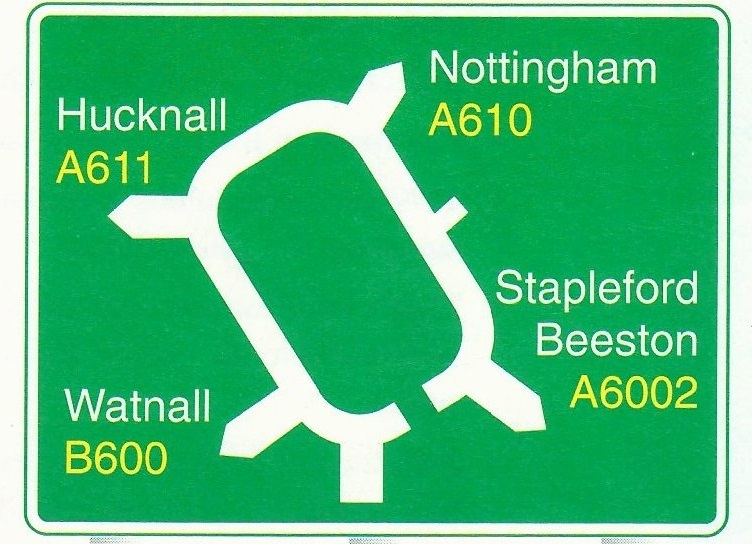 2)How many exits to get to the Nottingham exit? So we are turning RIGHT, 3RD EXIT following the A610. If the lanes are unmarked, TURN RIGHT 3RD EXIT. 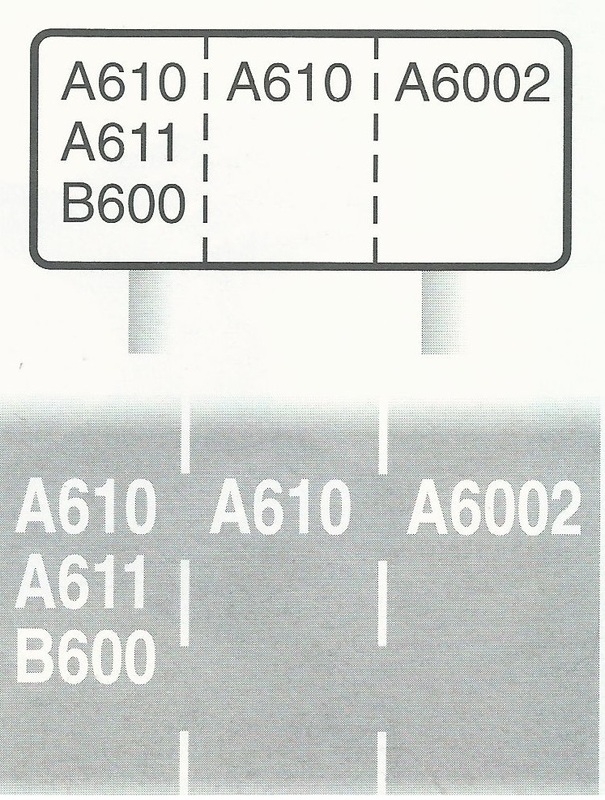 If route numbers are marked, follow the A610. So with designated lanes we are now selecting lanes 1 or 2 as they are marked A610. Both lanes will take you there as long as you remain in the lane and don't straddle lane markings into other lanes. Drivers often get confused on such roundabouts as they have failed to select the route number from the sign. If you don't know the route number how will you know what lane to select? The result would be a driver who ends up using the right hand lane (as they are aware they are turning right), realising as they negotiate the roundabout that it is taking them past the required exit, and so cutting across lanes to attempt to leave the roundabout, CHAOS!! See how the green car enters the roundabout into the far right hand lane, and without changing lanes it takes the vehicle to a specific exit. If lanes start to widen, they usually divide up into more lanes. Ideally keep to the left of the lane otherwise you could end up entering a new lane that takes you further around to an exit after the one you wanted. Taking a driving test is a big day and you will have put a lot of work into preparing for it. The closer you get to it, the more tension can build and nerves kick in! There are things you can do and things you should know that can help you to feel more relaxed and not get so nervous. 1) Make sure your test booking isn’t coinciding with other stressful events such as exams or a house move for example. 2) Don’t tell everyone about it. It’s great if you pass but the thought of having to tell everyone you were not successful can put you under pressure. 3) Put your driving licence safe and to hand. There is nothing worse than not being able to find your licence the day before the test! 4) Don’t stay out late the night before. Have an early night and do something relaxing. Don’t stress yourself cramming with a highway code! 5) If you are worried, call your instructor for a chat. Don’t bottle it all up. 6) Remember that the examiner is human and just doing a job. Contrary to what people say examiners do actually want you to pass, so don’t think they are going to try and catch you out, they can only mark you on what they see you do wrong. 7) Examiners may or may not chat to you as you drive. If they don’t, it’s not because they are not friendly, they will want you to concentrate as best you can for you to get the best result from your drive. 8) Don’t always believe stories from other people about their driving tests. People often exaggerate what actually happened, especially if it was a failed test. 9) Make sure you discuss any shortfalls in your driving ability with your instructor so you can deal with them before you commit yourself to a test. 10) Make sure you do a few mock tests before the real thing so you know what to expect. 11) If your not successful make sure you listen carefully as to what the examiner tells you at the end of the test. You may be given advice as to what you need to do to improve before you next take a test. 12) There are billions of people all around the world who can drive, if they can, so can you! 13) Don’t be afraid to ask an examiner to repeat an instruction to you should you forget it or not hear correctly. 14) Don’t worry if you go the wrong way, your being marked on your driving performance, not on directions! 15) Drive as you normally would on a lesson. Don’t try to be quicker or more cautious, drive in the same way your instructor has shown you to. 16) Touching a kerb doesn’t always mean a fail. The circumstances surrounding some faults will determine how serious it is. So if you do something wrong, forget it and concentrate on the rest of your drive. 17) If you come across something new, go with your gut feeling. If it feels right, then it will be, if it feels wrong, then it most likely is. Here is some more detailed information regarding the Theory test and the Practical Driving test. You will need to study the Highway Code MANY times, and If you have access to a PC at home then a CD ROM such as 'Driving Test Success' will really help you to prepare, and comes with a Hazard Perception Test CD too. Pupils at nicedriving have FREE access to Theory Test Pro which includes all the study material required (Click on Banner at the top of this page). The DVSA also have publications such as 'Driving, The essential skills', which are a useful source of information. The theory test is made up of two parts. Firstly you will need to answer 50 multiple choice questions and successfully answer 43 or more correctly to pass. You will then be required to watch a series of 14 video clips and identify developing hazards at the appropriate time in order to score points out of 5. You will need an overall score of 44 or more out of a possible 75 in order to successfully pass. There is a Theory test centre located at Abbey Lawns business park in Shrewsbury. You are required to take your driving licence with you. On the day of your test you will need to book your lesson for two hours. The two hours then gives us time for a drive round first to recap and practice, and then time for the test itself. You will need to take your driving licence and you will be expected to be able to read a number plate at 20 metres. When you take the test it will start at a special test centre and you will be expected to drive on public roads accompanied by a DVSA examiner (not your instructor). The test will take about 40 minutes in duration. The examiner will record any errors with your driving as either a driving fault or a serious fault. You are allowed up to 15 driving faults and not one serious fault in order to pass. Before a test is booked you will have completed your course and will have completed a few mock driving tests to prepare you. By the time you take your test you will know what you will need to do, so there shouldn't be any surprises! Nicedriving driving school uses the Shrewsbury Driving Test Centre located near Battlefield. Notice how there is no mention of hesitancy?? Yet so many pupils worry about being faulted for taking too long, and so try to rush at junctions and fail, adding to the number one statistic!! Please note that the use of wording in this guide is the intellectual property of nicedriving. Legal action has already been taken against one website copying this site word for word, and checks are frequently made for other 'copy and paste sites, where again action will be taken.